"We've become a bit of a destination, which I didn't expect," says Lou, taking a moment to relax towards the end of a busy day. "One guy came over from the south side deliberately, bypassing several other cafés, just to spend time here." She's talking about Biblocafe, the café-bookshop she set up from scratch three and a half years ago. Located in Glasgow's vibrant west end, it's a place with a lot of competition, but it's doing well despite that. It's popular within the local community and has many regular customers. So what makes a business like this a success? "It was always more about the books for me," Lou explains. "I realised that there was nowhere around here where you could just sit on your own and read. If you tried to do it in a pub there'd always be somebody bothering you. But I used to live in Spain and there are lots of places there - you find them wherever there are tourists - so I stole the idea." 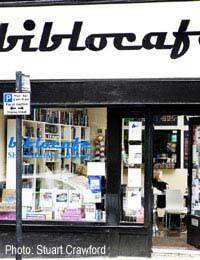 The books certainly give Biblocafe a distinctive atmosphere. There's a long row of them at one side of the café's main room, and more upstairs. "They're mostly light fiction because it's really about reading for pleasure, but we do stock all genres," Lou says, adding that she's quite happy for people to sit around and not have to worry about eating and drinking all the time. This relaxed way of doing business has made her more successful, as customers enjoy the easy-going atmosphere. Biblocafe is also well known in the community as a place to see the work of local artists, with a different exhibition each month. It has shown a lot of different work, from pencil and ink creations to photography, and recently scored a hit with a collection of drawings of monsters. All the artists live and work nearby. Some cafés charge for exhibition space, but Lou has chosen not to. She doesn't charge commission either, but she feels the business has done very well out of it, as the artists have done a great deal to promote her business and she's had "fabulous feedback". Many people visit the café specially to see the art, and naturally most of them stop for a coffee and a bit to eat whilst they're there. Biblocafe was designed as a simple, low-cost enterprise. It has only three members of staff, though Lou admits that she sometimes ropes in regulars to help at busy times. Serving from the bar rather than providing table services has enabled her to keep prices "in a range I feel is reasonable". It works out well for her, as she enjoys having a job where she can sit around with a book and a coffee. "If I had just two pieces of advice to give to other people starting this sort of business," she says, "they would be these: get together every bit of money you can before you start; and once you're open, if you say you're going to be there, be there." She's very firm about making sure the café is open at the same times every day, unlike many small businesses which lose custom because they vary their hours to fit in with the owners' personal lives, meaning customers can't plan visits. Before opening the café, Lou had worked for Starbucks and Whitbread and had run bars, so she knew what she was getting into. She gets on well with the owners of many other local eateries and is happy to make recommendations to her customers, providing she's used places herself. Ironically, her choice of location was an accident, a last minute decision, but she's built up a very successful business in an area she now loves.